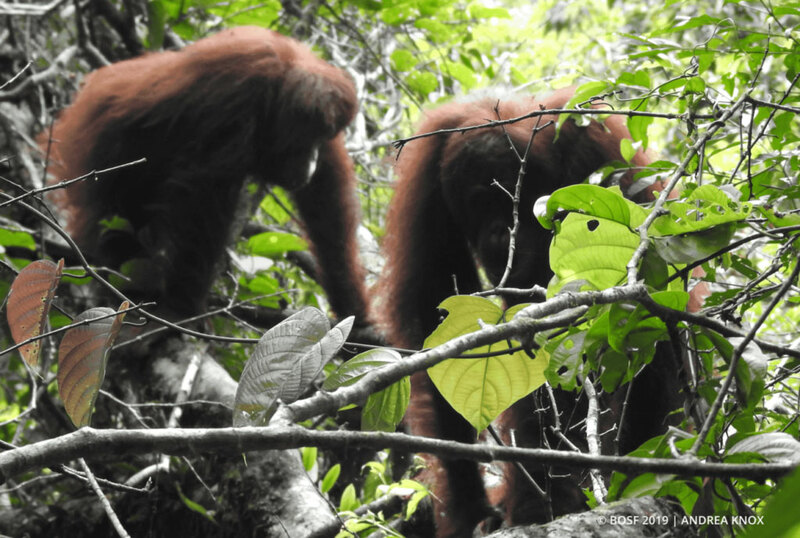 January 23, 2019 — As with humans, interactions between orangutans can be very unique. 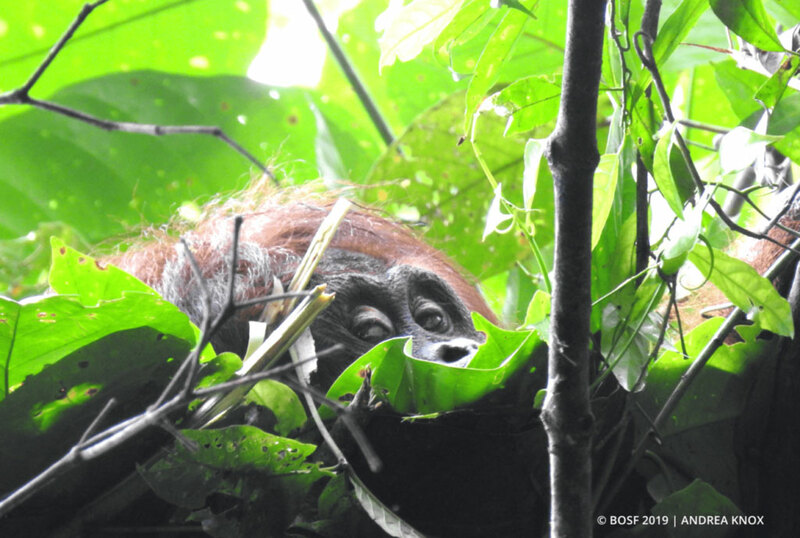 This is evident from the information recorded in the observation reports our Post-Release Monitoring (PRM) team from Totat Jalu Camp, in the Bukit Batikap Protection Forest, took a few months ago on released orangutans Compost and Sifa. In November 2018, Purnomo, my observation partner for the day, and I tracked Compost to a nest a mere 100 meters from the river. We were pleasantly surprised to find that she had reunited with her friend Sifa (whom you may remember from ‘Sifa’s Adventures in Batikap’. 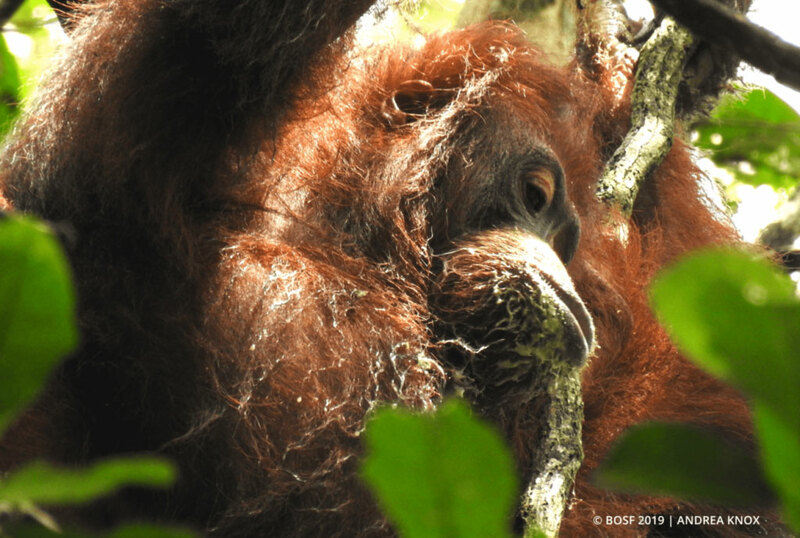 Compost, who was heavily pregnant at the time, spent most of the day traveling through the forest at a slow, but steady pace in search of her favorite foods. 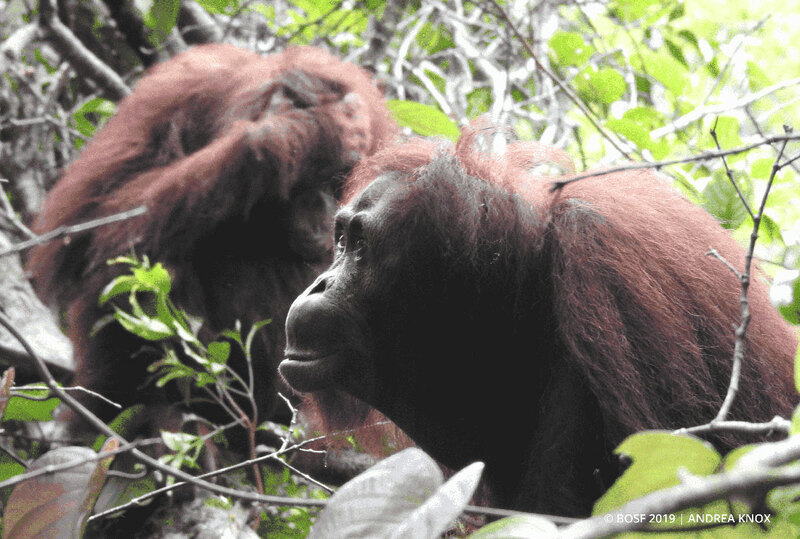 Sifa followed her throughout the day, but mostly kept to herself, and would only join Compost when she fed on juicy forest fruits and succulent pilang shoots. The pair shared an affectionate moment in the afternoon, when they rested on a large tree together and took turns grooming one another. After 10 minutes, however, Compost decided that she had had enough. She moved to a ficus tree to enjoy one last snack before constructing her night nest just before 4 p.m. This was early for Compost, who normally retired to her night nest at around 5-6 p.m.; but at nine months pregnant, we did not think much of it. Meanwhile, Sifa was a few trees over, munching away. It took about five minutes for Compost to complete her nest – but what happened next was odd, to say the least. She entered the nest, looked over at Sifa, and immediately descended the tree. She hit the ground and took off! I followed behind and continued to observe her from a safe distance. When I realized she had already moved 150 meters away from Sifa, with no sign of stopping, I was forced to end my observations of her and return to Purnomo and Sifa. Sure enough, once Sifa looked over and found that Compost’s nest was empty, she was distraught. She started circling the area, climbed the highest trees to look around, and let out loud cries. After 15 minutes she abandoned her search and built a nest to sleep in. Purnomo and I came to the conclusion that Compost had built the nest to fool Sifa, so she could shake her loose! We were shocked by the cunning plan this normally sweet and doting orangutan appeared to have concocted! Still, we were also in awe of the intelligence and determination she displayed in carrying out her ploy. Perhaps expectant mother Compost wanted to have some ‘me time’ before the arrival of her first baby?